Summer looks that will take you from work to rooftop drinks. We all know how stressful picking out an outfit can be. But what if we told you about a magical outfit that can carry you from day-to-night without so much as a shoe swap in between? With the summer heat coming in full force, having an effortless day-to-night outfit is a must. Avoid the hassle of a midday outfit change with these summer looks that will take you from work to rooftop drinks! With endless styles to choose from, versatile dresses are the perfect addition to your summer wardrobe. From pastel colored mini dresses to wrap silhouettes, it’s impossible to make a wrong style choice. Pair your favorite dress with sneakers for a casual look, or with heels to dress the look up. Consider going for a fun and frilly dress with accent sleeves like blogger @weworewhat. To achieve a simpler look, stick to a structured dress and accessorize with statement jewelry. To stand out, go for a flattering midi-length dress. Not only are midi dresses different, but they are also super trendy. @mvb rocks one with a slit from Realisation Par and styles it with chunky sneakers, cute sunnies and a quilted leather bucket bag. As your day carries on and the temperature gets a little cooler, feel free to throw a light wash denim jacket over your dress to tie the look together. Because shorts aren’t appropriate for every occasion, opt for a pair of thin, linen pants that you can wear all day and night. 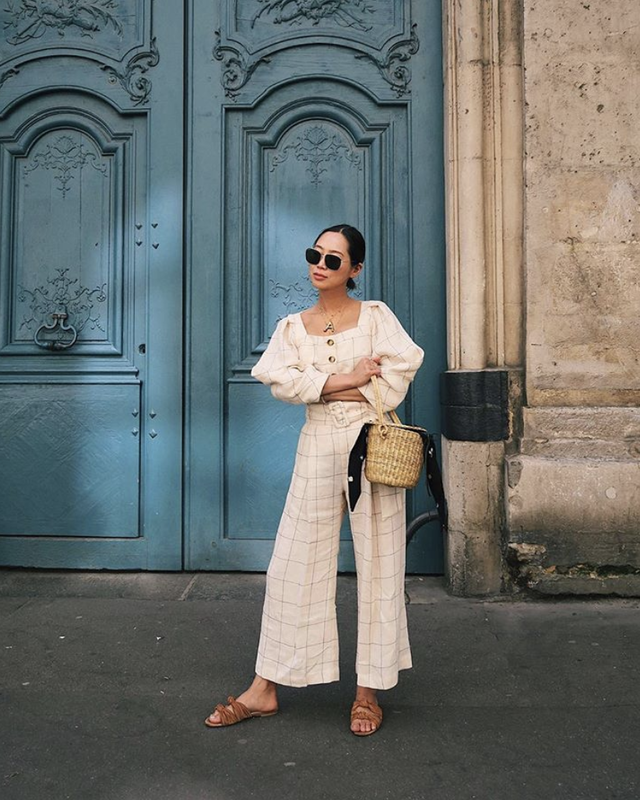 Offering a sophisticated and polished look, culottes- wide leg trousers that are often worn high waisted- have also become a hot trend this summer. These pants give you legs for days. Not to mention, they define the skinniest part of your waist. Even though culottes elongate your legs naturally, search for a vertical striped pair to give the illusion of even longer and leaner legs like @lainyhedaya and @songofstyle. Sometimes these pants are sold as part of a matching set, another major trend this summer that always looks super chic. If not, pair them with a frilly crop top, and you’ll be on your way! What’s not to love about a shoe you can easily slip on and off? Dainty slides and sandals are a summer must-have. Breathable, easy and fashion-forward, slides go with just about any look. Consider styling mules and sandals with a polished white button down and jeans or a mini skirt and tank. For a dressier look, try searching for a sandal with a little block heel! Because slides have no ankle straps, you have the opportunity to showcase your fav anklet bracelet. Skinny jeans just aren’t cutting it anymore. Although boyfriend jeans have been in style for quite a while now, the denim trends have not stopped there! Flare jeans and straight cut jeans have also become a staple denim trend. Upgrade your denim look with a flashy chain belt, like blogger @marianna_hewitt. If you pair your jeans with an off-the-shoulder blouse or a simple white tee, consider styling it with a neutral brown belt. Add a pop of color to your outfit by rocking a pair of statement sneakers. Ditch your go-to leather handbag for the newest summer trend. Straw handbags are chic, summery, and the options are endless. From the rounded cross-body to the classic wicker tote, there’s a straw bag for any fashion taste. Blogger @collagevintage sports her straw handbag at the beach, giving it a bohemian-casual feel, while @weworewhat shows the practicality of the bag, using it on the streets of NYC in a trendy midi. Next time you are looking for an easy summer outfit, try these simple, yet practical looks. Your summer outfits will be in check all day and night.